A solution already exists for paperless letters; digital letters, but for some reason their adoption is still not universal within the NHS. This creates a strange dichotomy for driving the paperless initiative forward. Lots of hospitals have reduced their paper trail by opting for digital records, but this didn’t end up offering anything useful because their degree of ambition remained quite small. This just saved some real estate as physical space was no longer needed for storing information. Failure of digital implementation leads to more harm than good. If digital implementation goes wrong this results in creating more problems than benefits for a hospital. The fear of poor implementation can therefore put hospitals off digital transformation. Our greatest success stories of transforming hospital communication are often reliant on seamless collaboration with senior IT staff and clinical leaders. An understanding of the full scope of all the systems that communicate with patients needs to be established and taken into consideration. This can only be achieved by looking from the operational as well as the technical perspective. There are some genuine drivers for change that are natural to the system. Often the answer to creating this necessary change is technology. For example, financial pressure and the potential savings of going paperless catalyse the NHS’ desire for digital transformation. Improved patient experience is another driver for change, as well and improved quality and governance. The digital maturity of a hospital plays a part in digital adoption. For example, some hospitals still use a COW (computer on wheels), which is literally a computer that gets pushed around on wheels with a massive battery on the back of it. 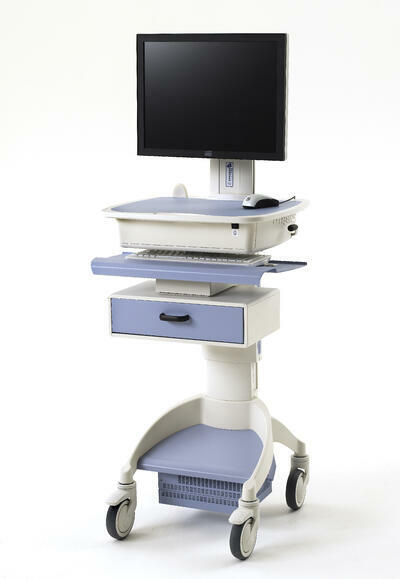 This can be a hospital’s answer to mobile technology. At DrDoctor, we understand that every hospital comes from a different place and has their own unique set of challenges. We facilitate the navigation of the digital landscape by serving as their transformation partner. The drive for Paperless by 2020 has often been described as ambitious for the NHS and a lot of speculation has gone into whether this goal is viable or not. We feel that it does not matter if the NHS meets the goal of Paperless by 2020. What really matters is helping staff and patients to communicate better. The incredible pace of change in the tech world means that technology will advance faster than politicians, managers and regulators can ever plan for. The real innovators will always solve real problems that matter now, almost as per natural selection. Inversely, this means that the NHS will prioritise solving the problems that naturally matter the most. The desire to go paperless might not be the most urgent challenge and therefore might not be solved by 2020. Our opinion here at DrDoctor is that a fundamental redesign of communications needs to take place. ‘Paperlessness’ is just a small stepping stone to that.